Since his arrival in France, Lama (or high priest) Gyourmé’s objective has been clear: to provide a place which is the most conducive to study, thought, and meditation for all. Lama Gyourmé is a true master who has taught Tibetan Buddhism in France since 1974, the moment when Kalou Rinpoché and the 16th Karmapa (head of one of the four major schools of Tibetan Buddhism) conferred this mission upon him. 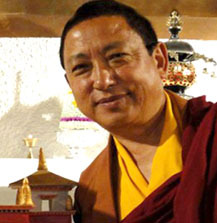 Born in Bhutan in 1948, Lama Gyourmé was entrusted to monastic life at age 9. He received the full Buddhist teachings through solid apprenticeship of traditional arts one of which being singing. The grand spiritual master Kalou Rinpoché of the Kagyu school of Buddhism was requested by the first westerners who had come to India to study and practice Tibetan Buddhism in the late 1960s to visit to their countries to pass on his knowledge. He granted their wish and sent several of his high priests to Canada and to several European countries. 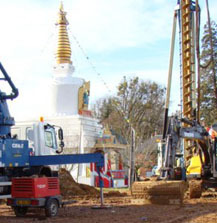 After some time in Paris, Lama Gyourmé oversaw the construction for the first Tibetan temple in Paris called Kagyu Dzong , which was inaugurated in 1985. In order to pass on Buddhism in the best possible way, the place where it is practiced should be well-suited to receive those who want to study this philosophy and to welcome visitors. 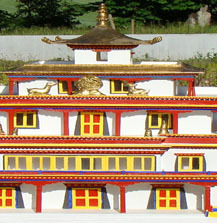 The architecture of a Tibetan temple is highly symbolic and has made the Vincennes Woods a privileged place for praying and for gathering one’s thoughts. 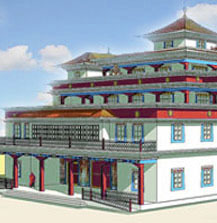 From its very architecture, it is also a preservation of Tibetan culture. Besides great Buddhist teachers, people of royalty: a queen, princes and princesses as well as artists have crossed the threshold of Kagyu Dzong. Today Lama Gyourmé is the spiritual master for 4 different Buddhist centers – 3 in France and 1 in Spain where spreading the thousand-year-old knowledge of Tibetan Buddhism has taken center position. First by teaching and sharing Buddhism as his masters wished, Lama Gyourmé has accomplished the works of an authentic spiritual builder. Of course his mission is not only for Buddhist communities but for those of the Western world seeking a profound meaning for their life and seeking inner peace.